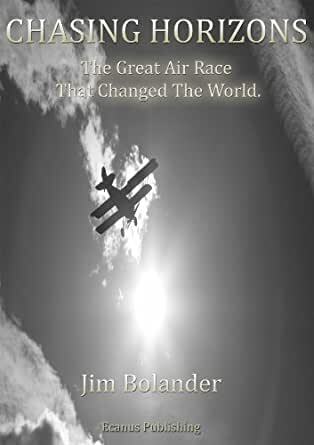 Chasing Horizons is a historical novel based on a six country competition to aeronautically circumnavigate the earth that took six months to complete and was followed by every newspaper in the world. It is a historically accurate story that the author was inspired to write when asked by his ten-year old daughter how her great great uncle could be the central character of perhaps the greatest adventure of all time, yet no one knows his name. Chasing Horizons is a father’s attempt to honor his daughter’s great-great uncle, and to remind the world of one of the most incredible races in human history that was the 20th Century’s largest peacetime logistical endeavor requiring the worldwide coordinated support effort of over 250,000 people. An amazing story of courage in a time where there were few, if any, radios, no radar, few gauges, absolutely no GPS, but a whole lot determination, talent, intelligence and skill. These men took the challenge to fly around the world by the yoke and one succeeded, Chicago, and her pilot, Lowell Smith. Britain, Italy, Argentina, Portugal, and France were all vying with the United States in 1924 to win the race to be first to fly around the world. Look at the stats! From: 04/06/24 To: 09/28/24 (Seattle to Seattle, WA) Miles Flown: 26,350 miles, Flying Time: 371H 11M, Plane Type: Douglas World Cruisers – Amphibians, Plane Names: Chicago, New Orleans, Seattle and Boston, Pilot Names: Lowell H. Smith, Erik Nelson, Frederick L. Martin & Leigh Wade, Comments: 1st Flight Round-the-World, 4 Planes started, 2 finished. There is actually a group in California that will attempt to do the same race in replicas of the planes. [...] I am in awe! An amazing story of courage in a time where there were few, if any, radios, no radar, few gauges, absolutely no GPS, but a whole lot determination, talent, intelligence and skill. These men took the challenge to fly around the world by the yoke and one succeeded, Chicago, and her pilot, Lowell Smith. Britain, Italy, Argentina, Portugal, and France were all vying with the United States in 1924 to win the race to be first to fly around the world. Look at the stats! From: 04/06/24 To: 09/28/24 (Seattle to Seattle, WA) Miles Flown: 26,350 miles, Flying Time: 371H 11M, Plane Type: Douglas World Cruisers – Amphibians, Plane Names: Chicago, New Orleans, Seattle and Boston, Pilot Names: Lowell H. Smith, Erik Nelson, Frederick L. Martin & Leigh Wade, Comments: 1st Flight Round-the-World, 4 Planes started, 2 finished. There is actually a group in California that will attempt to do the same race in replicas of the planes. http://www.seattleworldcruiser.org I am in awe!